Jeff Wall’s Picture for Women (1979) marks the transition of photography as an art form from the printed page to the gallery wall. Before this, photographs—from the orthodox photographic work of Walker Evans to the Conceptual photography of Dan Graham—seemed intended for the page even when hung in a gallery. In Picture for Women, a woman looks outward, as if at the viewer; a camera occupies the center of the photograph; the photographer stands on the right. Modeled on Manet’s famous painting Un bar aux Folies-Bergère, in which a barmaid seems to look directly out of the painting, observed by a man on the right, Picture for Women establishes its own art historical genealogy, claiming its rightful position within the canon. Wall’s photograph is an ambitious attempt to relate the artistic and spectatorial demands of the late 1970s to a modernist pictorial art that had been too hastily rejected by Conceptualism. 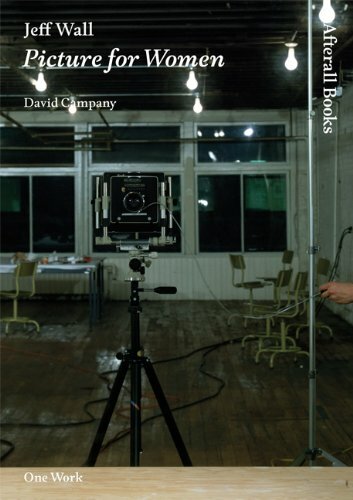 In this illustrated study, David Campany offers an account of Wall’s move from a Conceptual approach to a reengagement with the idea of a singular (as opposed to serial) picture. He shows that Wall’s decision to present his work as a large-scale back-lit transparency, together with his commitment to a singular image, amounted to a radical departure. He contrasts Wall’s idea of the photograph as a tableau or “picture,” inherited from the history of painting, with the works of the “Pictures Generation”—including Richard Prince, Cindy Sherman, and Jack Goldstein—and argues that Picture for Women is inseparable from the modern fate of the picture in general.